Seller ratings are an automated extension type that showcases advertisers with high ratings. Google gathers seller ratings from reputable sources that aggregate business reviews. Showing below text ads, seller ratings help people searching on Google to find businesses that offer quality service. Seller ratings can help advertisers improve ad performance and earn more qualified leads. Seller ratings show numbers on a scale of 1-5 alongside 5 stars. How do I enable Google seller ratings? A business needs to have collected 100 verified business reviews from Sitejabber in the last 12 months from the same country and a composite rating of 3.5 stars or higher in order to enable Google Seller Ratings. The reviews from users in a given country will only contribute to the business’ rating in that country. If your customers span several countries, make sure you collect 100 reviews from each country. How does Sitejabber set up Google seller ratings for a business? 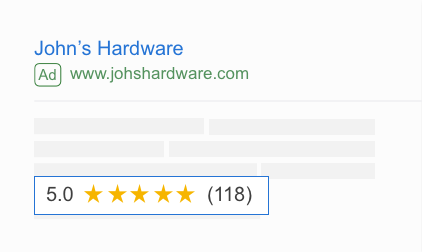 Sitejabber is an officially authorized Google Review Partner and supports Google Seller Ratings for its direct clients. Sitejabber sends a review feed to Google via this authorized partnership. Once the reviews are validated, they are sent to Google. Google takes 4-6 weeks to authenticate the data and only after it is certain that all the criteria are met, they then enable Seller Ratings for the business. Sitejabber doesn’t check the rating of the reviews before sending it to Google. In addition, duplicate reviews, reviews with no content (stars only), and reviews with spam or slander are excluded from the review feed. Why should I use Sitejabber for seller ratings? 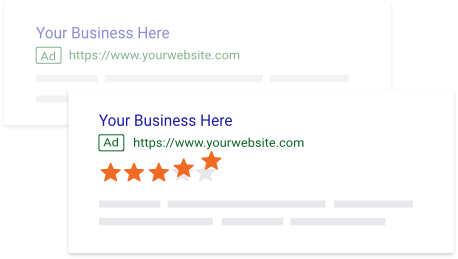 Because Sitejabber helps you collect new reviews from your customers on a regular basis, we are helping you achieve your goal of displaying Google Seller Ratings under your Google Ads campaigns faster and reducing your overall ad spend due to the increase in CTR and lower cost per click.